Pluto, which orbits the sun in an oval pattern, is, on average, more than 3.6 billion miles away from the sun. "Pluto" never comes any closer than 2.7 billion miles to the "Sun". 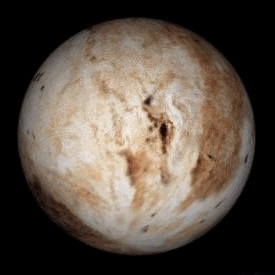 The name "Pluto" was given by Venetia Burney, an 11 year old school girl in Oxford, England. ("Out of the mouth of babes") The initials for "Pluto" are PL which are the same as "Percival Lowell", perhaps Percy was sending us a message from another dimension. Pluto is smaller than our own moon and has a mass of approximately 2 tenths of 1 percent of the planet Earth. The gravitational pull of Pluto is 10% that of Earth. Pluto is a very inhospitable place, with a core of rock and frozen elements along with a surface of frozen methane and nitrogen. The surface temperature of Pluto remains around 380 degrees below zero (Fahrenheit) at all times. That's only 79 degrees above absolute zero (minus 459 Fahrenheit) where the electrons in molecular structure have ceased to move. Pluto is so cold that water would be like rock and all gasses have condensed out on the surface. Pluto has a Mean diameter of 1,482 miles and rotates at such a slow speed that a day on Pluto is equal to 6.4 days on Earth. Pluto has 5 moons or Satellites named Charon, Styx, Nix, Kerberos and Hydra. "Charon" is about half the size of "Pluto" itself. "Charon" was named after another mythological character who ferried the dead across the "River Styx" into the underworld of "Pluto". 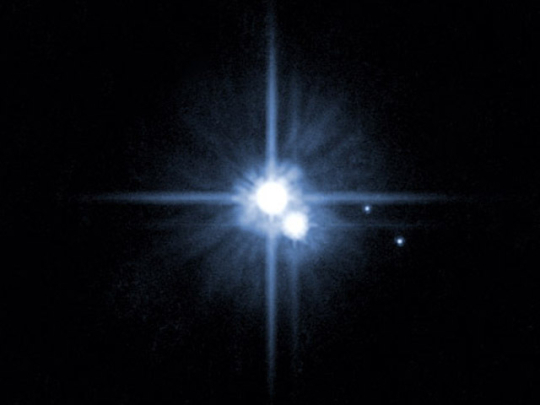 NASA's Hubble Space Telescope sent back images of the three moons orbiting Pluto (which is at the center of the image to the right) You can make out the moon Charon slightly below Pluto. The new moons, Nix and Hydra, are to the right of Pluto and Charon. The crude definition as to the composition of Pluto has left many questions. The latest discovery - after nearly two decades searching is that Pluto's atmosphere is filled with poisonous carbon monoxide gas. Pluto's atmosphere was previously known to extend more than 60 miles above the surface. New findings have now increased that height to more than 1,860 miles above the planet. My vote is for Pluto to stay in the lineup of discovered Planets. The NASA mission called the New Horizons Mission is scheduled to launch in 2006. The New spacecraft will do a flyby of Pluto, Charon and the outlaying "Kuiper Belt".